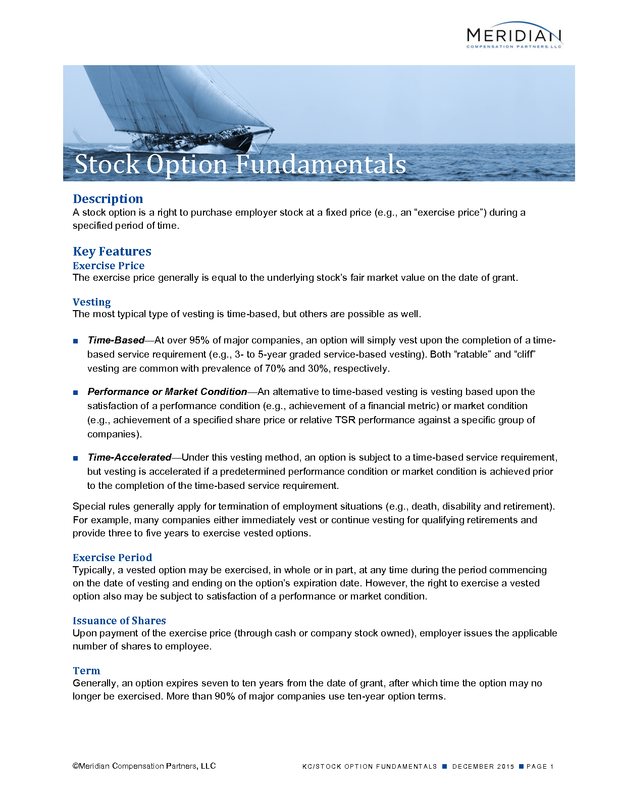 What you need to know about stock options in the executive compensation context. A stock option is a right to purchase employer stock at a fixed price (e.g., an “exercise price”) during a specified period of time. The exercise price generally is equal to the underlying stock’s fair market value on the date of grant. The most typical type of vesting is time-based, but others are possible as well. Time-Based—At over 95% of major companies, an option will simply vest upon the completion of a time-based service requirement (e.g., 3- to 5-year graded service-based vesting). Both “ratable” and “cliff” vesting are common with prevalence of 70% and 30%, respectively. Performance or Market Condition—An alternative to time-based vesting is vesting based upon the satisfaction of a performance condition (e.g., achievement of a financial metric) or market condition (e.g., achievement of a specified share price or relative TSR performance against a specific group of companies). Time-Accelerated—Under this vesting method, an option is subject to a time-based service requirement, but vesting is accelerated if a predetermined performance condition or market condition is achieved prior to the completion of the time-based service requirement. Special rules generally apply for termination of employment situations (e.g., death, disability and retirement). For example, many companies either immediately vest or continue vesting for qualifying retirements and provide three to five years to exercise vested options. Typically, a vested option may be exercised, in whole or in part, at any time during the period commencing on the date of vesting and ending on the option’s expiration date. However, the right to exercise a vested option also may be subject to satisfaction of a performance or market condition. Upon payment of the exercise price (through cash or company stock owned), employer issues the applicable number of shares to employee. Generally, an option expires seven to ten years from the date of grant, after which time the option may no longer be exercised. More than 90% of major companies use ten-year option terms. NYSE and NASDAQ listing requirements—An equity plan under which options may be granted must be approved by shareholders pursuant to stock exchange listing rules. Section 162(m) requirements—Shareholder approval of the material terms of an option grant is required for it to qualify as “performance-based” compensation for purposes of IRC Section 162(m) and, therefore, to not be subject to the $1 million deduction cap applicable to nonperformance-based compensation. Note: Additional requirements must be satisfied for stock options to qualify as “performance-based” compensation. The tax considerations discussed here relate to nonqualified stock options. Incentive stock options (ISOs), which are not discussed here, are accorded special tax treatment. To receive this special tax treatment, an option intended to be an ISO must satisfy certain written and operational requirements under IRC Sections 421 and 422. The following tax consequences assume that the option is exempt from IRC Section 409A (see discussion below). At vesting. No tax consequences. At exercise. “Spread” is taxable as ordinary income at exercise. Spread is equal to the excess of share price on date of exercise over exercise price multiplied by number of shares subject to the exercised option. At sale. If shares received upon exercise of option are later sold, then any gain/loss on sale of shares (i.e., post-exercise share price appreciation/depreciation) is taxable as short- or long-term capital gain/loss, depending on how long the shares are held. Deduction timing and amount. Employer may take a tax deduction in the amount and at the time the employee realizes ordinary income upon option exercise. 162(m) implications. IRC Section 162(m) denies deduction for compensation in excess of $1 million paid to CEO and top paid three executive officers (excluding CFO), unless “performance-based” (see discussion above regarding shareholder approval). Note: The following discussion ignores forfeiture rates and expected tax benefits. The option’s grant date “fair value” is amortized over the option’s requisite service period (e.g., typically the vesting period). “Fair value” is determined using an option pricing model (e.g., Black-Scholes or binomial model). Any recognized compensation cost may not be reversed after requisite service has been rendered. In addition, no previously recognized compensation cost may be reversed if a vested stock option expires unexercised. Previously recognized compensation cost should be reversed if option is forfeited due to employee’s failure to satisfy service requirement. Each reporting period, the number of options expected to vest is predetermined and the grant date “fair value” of these options is amortized over the remaining requisite period less amounts previously recognized. At the end of the requisite service period, compensation cost is trued up to equal the “fair value” of the options that actually vest. Previously recognized compensation cost for options that did not vest would be reversed. The option grant date “fair value” is amortized over the option’s requisite service period. Vested and non-vested stock options are not included in the computation of the denominator of basic EPS. Stock options with service conditions are included in the computation of the denominator of diluted EPS using the treasury stock method if the option is dilutive (generally, in-the-money options are dilutive). Stock options with performance or market conditions are included in the computation of diluted EPS if the options are dilutive (using the treasury stock method) and if their conditions (a) have been satisfied at the reporting date, or (b) would have been satisfied if the reporting date was the end of the performance period. Out-of-the money options are never considered dilutive and, therefore, are excluded from the computation of the denominator of diluted EPS.